• World premiere: 16/03/1991, Conservatoire national supérieur de musique et de danse de Paris (France), for the inauguration of the new Rieger organ – Éric Lebrun (organ). • CD “Saint-Germain-des-Prés” (Chamade 5630) (II. & III.). • CD “Neuf Jeunes Organistes compositeurs” (Hortus 037). 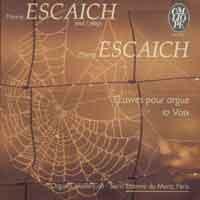 • CD “Escaich joue Escaich” (works for voices & organ) (Calliope 9937) (I & III). Pour écouter les Esquisses, cliquez sur une vignette. It is a cycle of three pieces written in 1989 and premiered by Éric Lebrun on the day the new Rieger organ of the Paris Conservatoire was inaugurated. This short piece is based on an obsessive and meandering movement on the Pedal keyboard; the permuting of durations adds a shifting, unstable character. (This ostinato will be heard further on, in the Esquisse III, but in a much more rhythmical way, somewhat like a final toccata). A number of staccato rhythmic figures (on the manual) and a chord motif (on the ‘plein jeu’) attempt to emerge from this ‘magma’ through a series of fleeting appearances, increasing in number and becoming more and more developed. After a momentary peak of intensity, the two worlds of sound are frozen in a brief coda, in which we witness the gradual destruction of the ostinato movement on the Pedal, while the last irruptions of the chords, fortissimo, coldly and almost (recalling the mood of Motet II) inexorably demolish what is left of the initial spinning movement. The Esquisse II, “Ritual”, is based on the opposition between two worlds, one, meditative, built on the superposition and the repetition of Gregorian antiphons, like a kind of litany, and the other, on the contrary, more lyrical, breathlessly punctuated by incessantly repeated, ponderous chords. The form of this piece, which at first consists in the stark opposition of these two worlds, tends increasingly to bring them together. Following the outcome of this merger, the work fades away in a long, pliant melody, exposed over a motionless background of sound. This piece is more restless. It plays on the superposition of two worlds of sound that are at first completely distinct: on the one hand, a polyphony calling to mind a Mahlerian Adagio, played on the Swell like the memory of some forgotten elegy; on the other hand, more aggressive rhythmic interventions on the Positive and the Great, based on fourth chords and more disjointed melodic contours, which, in successive waves, seem to be striving to get away from the nostalgic climate created by the polyphonic element. As the piece progresses, the rhythmic theme seems to assert itself, leading the polyphony (simply modal at the beginning) to greater density, emphasized by chromatism and polytonality. Once the final bursts of polyphony have disappeared, the piece launches into a lively toccata, a sort of ‘sacred dance’, and the initial adagio makes one last attempt to become a part of it.